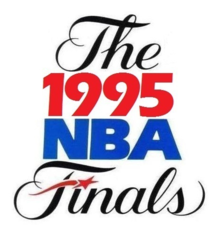 The 1995 NBA Finals was the championship round of the 1994–95 National Basketball Association (NBA) season. The series pitted the Eastern Conference champion Orlando Magic against the Western Conference champion Houston Rockets. The pre-series hype and build-up of the Finals was centered on the meeting of the two centers opposing each other: Shaquille O'Neal of the Magic and Hakeem Olajuwon of the Rockets. Going into the series the matchup was compared to the Bill Russell–Wilt Chamberlain matchup of the 1960s. The Rockets became the first team in NBA history to beat four 50-win teams in a single postseason en route to the championship. The Rockets would win a playoff-record nine road games in the 1995 playoffs. It was the second NBA Finals sweep in the 2–3–2 Finals format (after the Detroit Pistons did so against the Los Angeles Lakers in 1989). The Rockets also became the first repeat NBA Champion in history to keep the title with a sweep. In addition, the Rockets became the first team in NBA history to win the title without having home-court advantage in any of the four playoff rounds since the playoffs was expanded to a 16 team format in 1984. Coincidentally, this feat would also be achieved by the New Jersey Devils that same year, when they won the Stanley Cup over the Detroit Red Wings. The Orlando Magic (making their first ever NBA Finals appearance) began the 1995 NBA Finals at home, hosting the defending champion Houston Rockets. With the Magic up 110–107 late in Game 1, Nick Anderson missed four consecutive free throws in the closing seconds of the game, and Kenny Smith hit a three-pointer, tying the game and sending it to overtime as well as setting a new record with the most three-pointers in an NBA Finals game with seven. The more experienced Rockets went on to win in overtime and eventually swept the Magic, winning their second consecutive NBA Championship. In achieving this, they earned the distinction of being the only team to win both championships during Michael Jordan's first retirement (although Jordan did return in the closing months of the 1994–95 season), as well as the only one outside Chicago to win multiple championships in the 1990s. The season-ending documentary Double Clutch by Hal Douglas, was released by NBA Entertainment to coincide with the Rockets' championship season. The Rockets entered the 1994–95 season as defending champions, but they struggled to maintain last season's form due to injuries and off-court-distractions. On February 14, the Rockets acquired Clyde Drexler from the Portland Trail Blazers, but the trade of a hometown hero (Drexler was a teammate of Olajuwon at the University of Houston) did not improve matters, and the Rockets settled for the sixth seed with a 47–35 record. However, the Rockets once again lived up to its Clutch City reputation come playoff time. En route to the Finals, Houston defeated three teams with 55 or more victories. They began by ousting the Utah Jazz in five games (the Rockets trailed 2–1 after three games), then repeating last season's comeback effort over the Phoenix Suns (the Rockets trailed 3–1 after four games), before outclassing the top-seeded San Antonio Spurs in six games of the conference finals. The Magic were only in their sixth season of existence, but they were a team on the rise. Led by All-Stars Shaquille O'Neal and Penny Hardaway, new acquisition Horace Grant, and franchise cornerstones Nick Anderson and Dennis Scott, the Magic rolled through the Eastern Conference, winding up with a then-franchise best 57–25 mark. Orlando's road to the Finals began with a convincing 3–1 series win over the Boston Celtics. They followed it up with a six-game ouster of Michael Jordan (returning from an 18-month retirement) and the Chicago Bulls in the second round, and in the conference finals, they vanquished the Indiana Pacers in a tough seven-game series. This was the second NBA Finals that ended in a 4-game sweep since the Finals went to the 2-3-2 format in 1985 (1989 was the first). Kenny Smith hit a then-Finals record seven 3-pointers, the last tying the game up at 110 with 1.6 seconds left following Nick Anderson's four straight missed foul shots. In overtime, Hakeem Olajuwon tips in a missed finger roll by Clyde Drexler with three-tenths of a second left to win the game. Hakeem Olajuwon records a double-double with 34 points and 11 rebounds to lead the Rockets to a 117-106 victory to take a 2-0 series lead. The Magic, on the other hand, becomes the 2nd team in NBA Finals history to lose the first two of their four home games. Robert Horry hits a 3-pointer to give Houston a 104-100 lead with 14.1 seconds left. Olajuwon outscores O'Neal by 10 points and caps off the sweep by hitting a memorable yet uncharacteristic 3-pointer in front of O'Neal. By winning his second straight NBA Finals MVP award, Hakeem Olajuwon became the sixth player to win the award on multiple occasions, joining Willis Reed, Kareem Abdul-Jabbar, Magic Johnson, Larry Bird, and Michael Jordan. Jordan and Olajuwon at the time were the only players to win the award consecutively. The Rockets' championship reign would end in 1996, where they were swept by the Seattle SuperSonics in four games of the second round. The Sonics were also the last team to beat the Rockets in the playoffs prior to their two-year championship reign, when they defeated them in seven games of the second round in 1993. That year, the Rockets won 48 games and achieved the fourth seed. The following offseason, the Rockets attempted to make it back to the finals by adding former NBA MVP Charles Barkley. However, age and injuries would take its toll, and the closest the Rockets would achieve after their two-year championship reign was a six-game loss to the Utah Jazz in the 1997 Western Conference Finals. The Magic would have another strong season in 1996 winning 60 games. However, they were swept by the Chicago Bulls in the Eastern Conference Finals, who would go on to win the NBA championship after registering a league-record 72 wins (and the next two championships after that, for their second three-peat). The following offseason, Shaquille O'Neal joined the Los Angeles Lakers, and went on to win NBA titles with the team in 2000, 2001 and 2002 (he would also win one with the Miami Heat in 2006). The Magic would not make it back to the finals until 2009, which they lost in five games. ^ History of the NBA Finals: Hakeem Olajuwon: The NBA’s Best In The Mid ’90s, hollywoodsportsbook.com, accessed February 16, 2007. ^ NBA Finals Records Archived 2007-10-13 at the Wayback Machine, Basketball.com, accessed February 16, 2007. "Shaq and Olajuwon's Game 1 battle in the 1995 NBA Finals deserves a deep rewind". SB Nation. February 23, 2019 – via YouTube. This page was last edited on 23 February 2019, at 22:40 (UTC).